Kendata Peripherals has introduced a new software utility that will significantly reduce the amount of time spent by teachers and lecturers on the marking of multiple-choice exams. Known as SEMS, the software works in conjunction with the AutoData forms-processing system to provide a simple report showing the title of the exam and a listing of candidate numbers,student names, corresponding percentage marks and the number of questions answered by each student. After the AutoData system has scanned students' answer sheets and entered their responses into an Access database, the user simply scans in a master sheet with the correct answers. The SEMS software then compares the students' answers with those on the master sheet and instantly generates the report. In addition, the new software can generate student response feedback reports for use in assessments to enable individual students to see which questions they answered incorrectly so that they can identify the areas that need additional work. 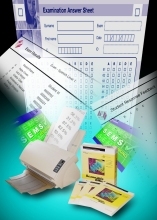 Particularly suitable for use wherever there is a range of computer literacy amongst teaching staff, the SEMS software is supplied with a standard exam answer sheet, which can be overprinted in Word with the exam number and student names, if required. More advanced users may prefer to produce custom answer sheets using the form design capability of the AutoData system itself, and they also have the option of carrying out analysis and generating custom reports within Access. The AutoData forms processing system, which is also ideal for other applications such as surveys or course evaluation, enables data to be scanned from paper forms directly into an Excel spreadsheet or Access database. As well as being compatible with AutoData, SEMS can be used with other forms-processing systems that generate raw data as an Access database table.